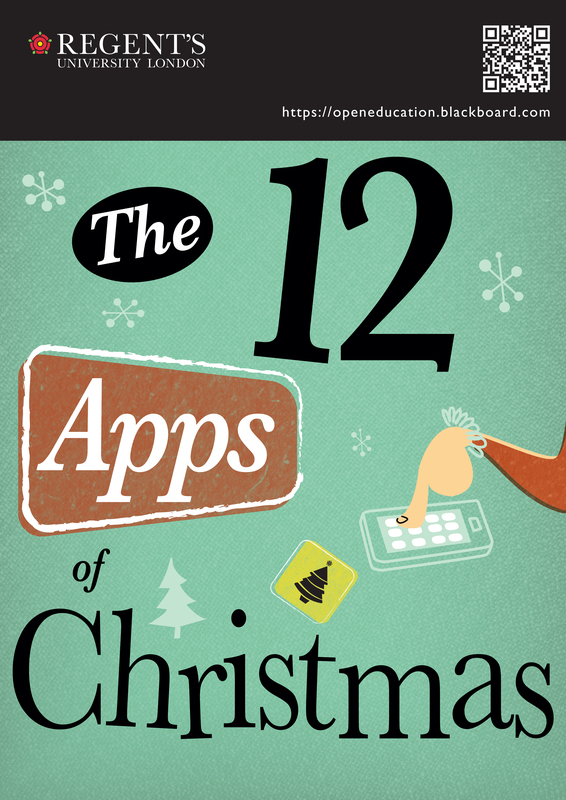 Twelve Apps of Christmas (12AOC) is an open online course created at Regent’s University London, which ran for the first time in December 2014. It successfully brings together educators worldwide to engage with a range of mobile technologies for teaching and learning. It is available under a Creative Commons licence. A key issue in outreach to higher education academics and support staff is their high workload and limited time for continuing professional development. 12AOC’s format is designed to overcome this barrier, and is now proven in successfully doing so. The twelve days of the course, over twelve working days in December, are modelled on an Advent calendar, covering a different free educational app each day. This both allows material to be presented in an entertaining and engaging manner, and breaks the course content down into small daily activities. The theme was inspired by the initial decision to run the course at a time of year when potential participants would be less busy. It also proved effective in garnering interest in the course and in retaining students. Raising the profile of information literacy within Regent’s University London. The Library and Learning Technology teams at Regent’s University London work with staff and students to promote the best use of available resources, but this work can go unnoticed by many colleagues. 12AOC gave us an opportunity to reach out within the university, engaging with co-workers who were not already champions of information literacy. The course attracted lecturers, but also support and marketing staff. In addition to the benefits of 12AOC itself, it fostered connections between Learning Resources and colleagues in other departments. Further, 12AOC raised the profile of our information literacy provision by reaching beyond Regent’s. Through networking with learning technologists and librarians at other institutions, we attracted over five hundred participants from higher education institutions worldwide. The course was popular and successful, and there are plans for it to be run by staff at other institutions. This external-facing success has led to the information literacy work done by Learning Resources being acknowledged within our own institution. Developing a digital resource which develops and enhances information literacy skills. 12AOC develops participants’ digital literacy skills regarding mobile apps that can be used in teaching and research. On each of the twelve days we introduced a different app to the participants. There was a summary of the app, what it could do and some ideas about how it could be used. Learners would then download the app and use it for a simple “10 minute activity”. These activities were deliberately kept practical to give the users a real feel of how they would use the app in practice. However, digital literacy is not just the ability use technology but developing the awareness and ability to use digital tools appropriately. Each app had an associated discussion forum, where course participants could reflect on the usefulness of the app and look at alternatives. As one of the participants wrote; “the discussion was definitely very useful; they provided a stimulus for others to say “that’s great”, or “it’s not very good”, or “have you tried this one instead”. It’s a bit like a conference… the presentations are needed to generate the discussion”. Elements of interactivity and flexibility. We received a high level of engagement from 12AOC’s participants. On the first day of the course we had 326 posts on the discussion forum made by 128 people. It was great to see conversations take off between participants as they commented on their own experience of using the apps. We also supported the course using the Twitter hashtag #rul12aoc, which added another level of interactivity. By monitoring and responding to forum posts and social media throughout the day, we were able to support those starting the course late, or those learning from within different time zones. The 12AOC format gives us flexibility to adapt it to the future needs of our university. Over time new apps supported by our University can be easily incorporated into the later iterations of the course. There will be a new version of 12AOC (with twelve new apps) starting in December 2015. Evidence of impact on the target audience. When we set up the course our target audience were the teaching and professional services staff at Regent’s, and the wider Higher Education community in the UK. It soon attracted international interest, too. By the final day the number of learners had risen to 543. The majority of the participants were from other universities in the UK, and some from other English speaking Universities from around the World. 36 of the participants had Regent’s email addresses, but we are a relatively small university so were very pleased with this level of active staff engagement. 12AOC has already been adapted and used by Dublin Institute of Technology, evidence of its success as a format. Innovation, initiative, originality and sustainability. There were two innovative aspects of the course. Firstly, its content. Because the use of apps is relatively new there are few resources on how to use them in a HE context. There is quite a lot of literature on the different apps available but very little considering using these apps with students. This is probably one of the reasons why we had so many people enrol.